The game marked the third consecutive defeats for the Islanders. Mumbai City FC suffered their third consecutive defeat in the Indian Super League after NorthEast United humiliated them in their own backyard. The visitors scored twice in the first 34 minutes, through a corner and a counter-attack that opened the holes on the left side of the Mumbai defence. Rowlin Borges, the star of the game, scored from the corner, while main man Baartholomew Ogbeche scored the second to win the game for The Highlanders. Their first away win since November in the Indian Super League. Singh was supposed to be the leader of the backline and cover up for them, but he came up with his own mistakes. The first goal was inevitable the moment the corner was taken, given the poor man marking from the Mumbai defence. But, the second goal would have disappointed Mumbai's fans the most. Amrinder could have done a lot better to restrict the lead of The Highlanders to just one goal, but he couldn't. The youngster turned out to be the villain of the game for The Islanders. The terrible positioning sense, the inability to understand and comprehend how long to chase the ball and the pathetic marking from Vignesh, forced tactician Jorge Costa to bring on Md. Rafique as early as the 34th minute of the game. Raynier had the Midas touch before the international break. However, the break has seen him lose his usual self. Raynier is struggling to put in a good shift since the league has resumed and the case was no different against NorthEast. What could a destroyer do when the defence behind him has big holes to fill? Drop back in the defence, maybe? That's what the former Kerala Blasters midfielder did. Milan was asked to fill in the holes and be the ball carrier. Singh did well and spent most of his time being in the defence, rather than shielding it. Nothing the 26-years-old could have done more. Stagnant, immobile Anwar Ali was poor in his marking sense, a trait of the Mumbai defence for the game. Anwar and Amrinder have to shoulder the blame for letting Ogbeche score NorthEast's second. The experienced centre-back was needed to lead the backline and distribute the ball in the absence of Lucian Goian, but couldn't do it. Better of the lot, but not good enough - that's the story of Souvik's game. He turned out to be Mujmbai's best bet against Ogbeche and Co. We are not saying this because he was good, instead because he didn't do anything as erroneous as the other members of Mumbai's backline. Rafique brought the calmness back into the defence, after having watched it get blown away by the counter-attacks of NorthEast in the first 34 minutes of the game. The defensive midfielder was played in an uncharacteristic position, as a right-back and he didn't disappoint his coach, unlike the others. He played for the final 14 minutes of the game and had the ball only eight times at his feet - not enough for him to be rated. TP Reheneesh's second, Pawan, did enough to not let his coach Eelco Schattorie miss his first-choice goalkeeper. He was largely untested, much credit to the defensive line who didn't let the likes of Modou Sougou and Arnold Issoko have the chance of getting close to the goal. Reagan had to face Bastos and Machado on the right wing of The Highlanders. But, due to Bastos having to drop deep into the midfield to get the ball and Vignesh underperforming, Reagan helped his centre-backs outnumber Mumbai's Sougou in the box. The strategy worked perfectly well and Issoko's crosses were hence dealt with easily. Rowlin Borges opened the scoring for NorthEast, maintaining his prolific run in the Indian Super League this season. Although, well served by the poor marking of the Mumbai defence, Borges still had to take the shot such that it goes into the net before meeting the gloves of Amrinder, which he did to perfection. In the midfield, his presence was felt more than ever, as The Highlanders' high pressing and closing down brought chaos to the Mumbai defence. NorthEast had all the things done rightly - they had all of their to-do boxes ticked at the end of the game. One of which would have been cutting out the influence of Sougou from the game, thus nullifying the attacks of Mumbai. Gurwinder, with the help of his full-backs, maintained a good defensive shape and made sure that The Islanders' striker doesn't take them for a ride in the game. Keegan had the most difficult job of them all - stopping the opposition's danger man Issoko. He did well, tracking back when needed. Although, he got outrun most of the times. The Highlanders' left-back ensured that the Islanders' Issoko doesn't cut into the middle, or put a dangerous cross into the NorthEast box. It was a resilient performance from the full-back. 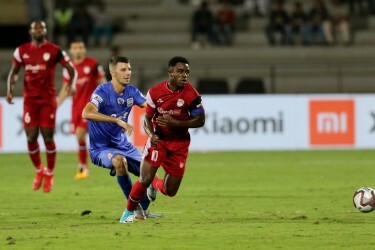 Lalthathanga managed to create problems on the left wing of the Mumbai defence, making sure that The Highlanders got enough out of the 34-minute cameo of Vignesh to end the game with three points. Other than that, he did okay man marking Bastos, sticking with him when he dropped deep and when he tried to make use of the width. Didn't play enough minutes to get rated.